Luis Contreras, a contractor orthopedic technician with the U.S. Air Force 99th Medical Group, performs a lumbar microdiscectomy surgery at Nellis Air Force Base, Nev., Aug. 27, 2018. A lumbar microdiscectomy surgery is performed to remove a portion of a herniated disc in the lower back. 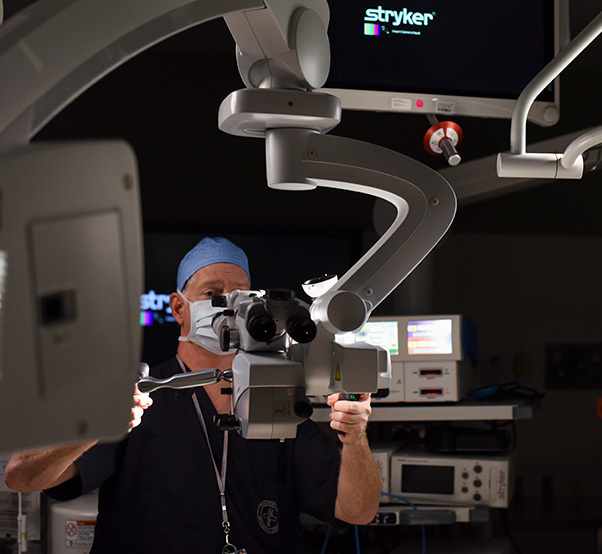 The 99th Medical Group successfully completed its first set of orthopedic spine surgeries after bringing two highly-specialized spine surgeons to the unit Aug. 20. As one of the more limited Air Force Medical Service specialties, orthopedic spine surgery has only three authorized surgeons in the entire Department of Defense, two of whom are now on the team at Nellis Air Force Base, Nev.
Having worked together for over a decade at other bases, Col. (Dr.) Edward Anderson and Maj. (Dr.) Bryan Lawson, 99th MDG orthopedic spine surgeons, bring a combined three decades of surgical experience to the operating table. 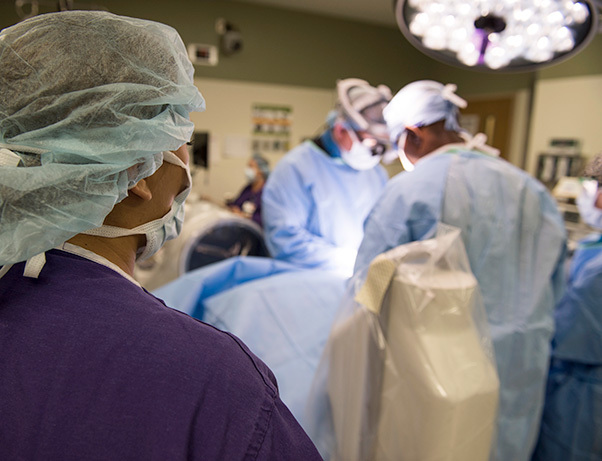 The newly arrived surgeons will have their work cut our for them, but their shared experiences will not only benefit their patients, but also the nurses and technicians who haven’t had exposure to the complexities of orthopedic spine surgery. 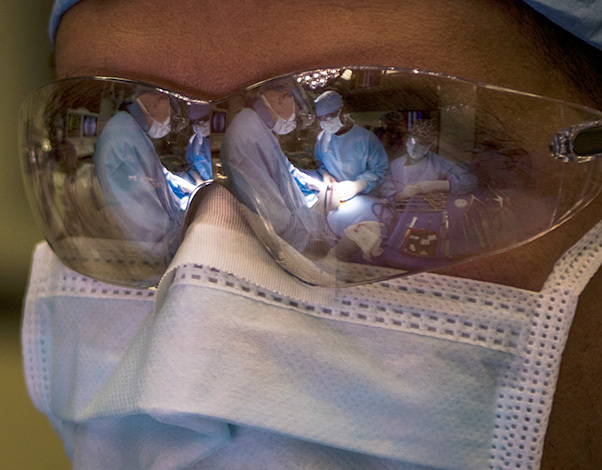 Airman 1st Class Kayla Vait, 99th Medical Group aerospace medical student, observes a team of Airmen perform orthopedic spine surgery at Nellis Air Force Base, Nev., Aug. 27, 2018. Students get the opportunity to observe surgeries to give them a better understanding of their job. Pietszak said the benefits of performing complex surgeries in the orthopedic spine clinic go far beyond the operating room because with each surgery performed, there is a great deal of preparation that also goes into it. From the medical technicians, nurses admitting the patient, to the medical logisticians acquiring the proper equipment and supplies and each surgery brings with it an opportunity for the expeditionary medics to hone their skills in preparation for deployment in support of global operations. Pietszak said this [orthopedic] clinic is a big win for the Air Force and for the patients receiving care from the medical group. Col. (Dr.) Edward Anderson, 99th Medical Group orthopedic spine surgeon, tests medical gear at Nellis Air Force Base, Nev., Aug. 23, 2018. Anderson has nearly two decades of surgical experience. As the clinic grows, the surgeons will have the ability to increase the care coordination for all eligible beneficiaries for the services offered at the medical center. This means more focus on individual medical readiness of all Airmen with spinal instability or deformity as well as an opportunity to increase the quality of care delivered to their families, retirees and other eligible patients of the Veterans Administration. This also gives other orthopedic surgeons here, who aren’t traditionally spine surgeons, the ability to scrub-in, or assist, on a spine case and learn some of the skill sets from Dr. Anderson and Dr. Lawson. While developing a robust spine program may take some time, the orthopedic spine clinic is just a small piece to a bigger plan that will make Nellis’ 99th MDG a more robust medical center and the backbone of DOD spine surgery. 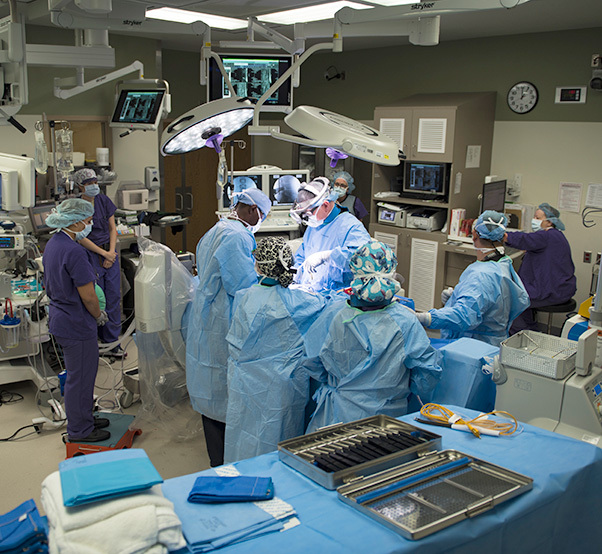 Airmen assigned to the 99th Medical Group perform in an orthopedic spine surgery at Nellis Air Force Base, Nev., Aug. 27, 2018. 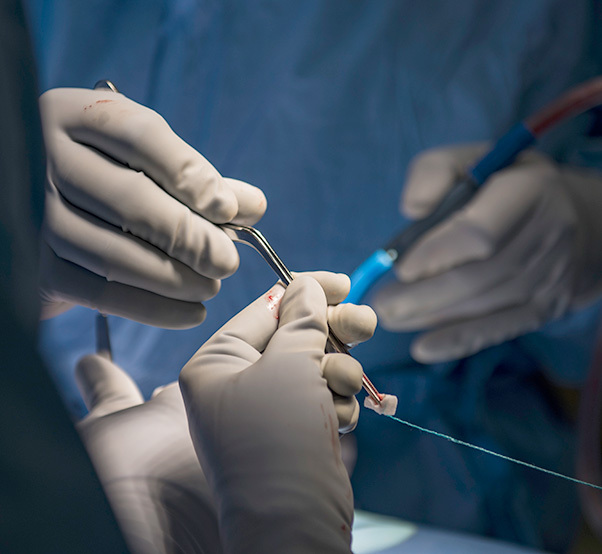 Having in-house surgeons allows patients to bypass referrals downtown. 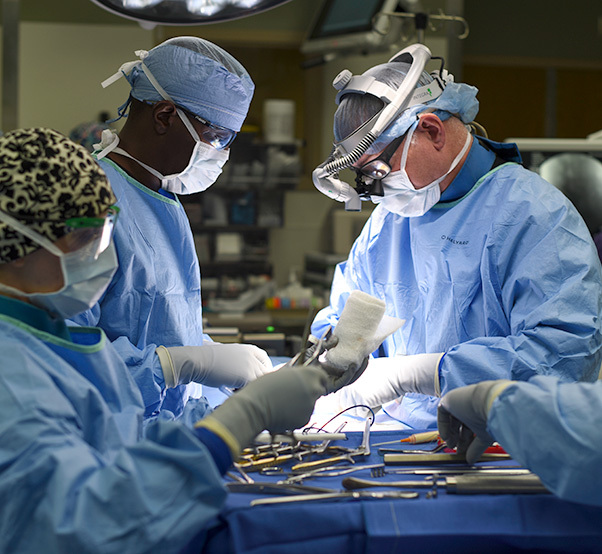 Col. (Dr.) Edward Anderson, 99th Medical Group orthopedic spine surgeon, performs a lumbar microdiscectomy surgery at Nellis Air Force Base, Nev., Aug. 27, 2018. A lumbar microdiscectomy surgery is performed to remove a portion of a herniated disc in the lower back. 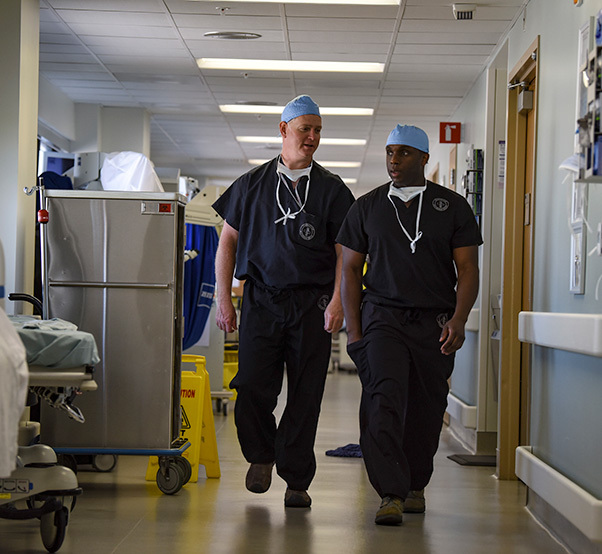 Col. (Dr.) Edward Anderson and Maj. (Dr.) Bryan Lawson, 99th Medical Group orthopedic spine surgeons, walk down a hallway at Nelis Air Force Base, Nev., Aug. 23, 2018. Anderson and Lawson have known each other for nearly a decade.